● If a Link Monster in your possession is destroyed by battle or an opponent's card effect while this card is in the GY: You can banish 1 other Zombie monster from your GY, and if you do, Special Summon this card. ● If this card is Special Summoned from the GY: You can activate this effect; this turn, this face-up card is unaffected by other cards' effects. 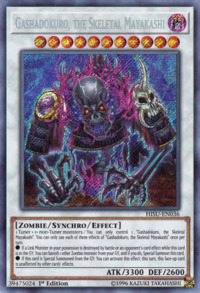 This card is based on the Gashadokuro (がしゃどくろ/餓者髑髏, starving skeleton), mythical creatures in Japanese mythology. They are spirits that take the form of giant skeletons and are fifteen times taller than an average person, said to be created from the amassed bones of people who died of starvation or in battle, without being buried. Legend has it that these Yōkai roam after midnight, grabbing lone travelers and biting off their heads to drink their spraying blood. There is a way to know of their approach, as the victim would hear the sound of loud ringing in the ear. The Gashadokuro are said to possess the powers of invisibility and indestructibility. The high Level and ATK of this monster may be a reference to the gigantic embodiment of this Yōkai and its blanket immunity when Summoned from the Graveyard may stem from the supposed invisibility and indestructibility it possesses. This monster is the Synchro counterpart of Yasha, the Skeletal Mayakashi. This card has the highest Level among all Zombie monsters.